Second, was Barney Farabaugh (1835-1862). He fought in several battles and contracted typhoid fever while marching through Alexandria, Va. He is buried at the military cemetery there. Anselm died at a party in Waterloo, Iowa. How? When? Why? Fr. Modestus gives no details. There are no other clues. He cannot be found in the 1870 Census, so I believe this incident happened between July of 1861 when his enlistment ended and the Summer of 1870 when a census was taken. I just now fired off an email to the Cedar Falls Historical Society. If they don’t come through for me, I don’t know if we’ll ever know. Charles here looks confident, like he has the answer – but he ain’t talking anymore. Addendum 29 Oct 2014. This mystery is solved. Anselm died from a fall in 1890 and is buried in Waterloo, Iowa. See comment for details. The article and tombstone are reproduced below. This entry was posted in Uncategorized on October 21, 2014 by Tony Bentivegna. Mystery solved! A wonderful researcher at the Cedar Falls Historical Society named Julie Huffman-klinkowitz (no relation) found an article detailing Anselm’s 1891 death in Waterloo, Iowa, and also his local tombstone! She reports there are several articles from the Waterloo Courier detailing Anselm’s business dealings there — and public drunkenness. The death was caused by falling 17 feet down from a stairway landing when Anselm was 50 years old. Heck, I fell 17 feet from attic drywall down to a concrete garage floor when I was 50, and just had a bruise. But that’s me, and I was sober as a judge. 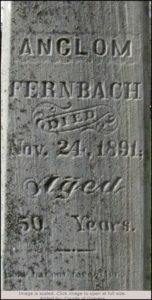 I was on the wrong track researching this particular relative because he (according to his tombstone) went by the name “Anclom Fernbach.” No way I could have guessed that. 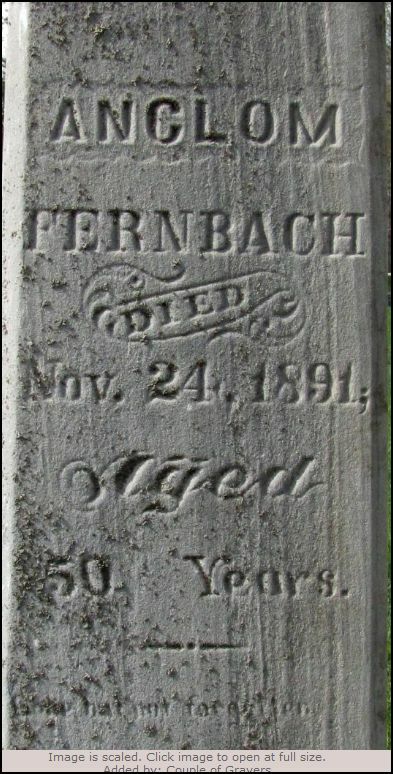 He was from the Michael branch that partially broke off and settled in Renville Co., Minnesota, and became “Farenbaughs.” The Pa. relatives that remained eventually used the Farabaugh spelling. The rogue Anselm ended up in Iowa at a time when any cognate of the name was possible. Images are added to the original post. The epitaph reads “Gone but not forgotten.” How prophetic!